The iPhone doesn’t seem to be doing action games so well. And by action, I mean anything that involves moving anything. But puzzle games? And strategy games? Now we’re talking. There are already countless (excellent) versions of Tower Defence available, but this is something special — SimCity. The classic, venerable, evergreen SimCity, one of the most popular and iconic games the PC has ever seen. Question is, can it make the jump to Apple's promising, yet problem-plagued touchscreen? SimCity 2000 - You love SimCity 2000? This is SimCity 2000 (with the aesthetic of SimCity 3000). Or, as close to its feature set and gameplay as the iPhone can manage. There are water pipes, bonus buildings, full control over amenities, advisors, the works. Basically, don't expect a bastardised port of SimCity, expect SimCity. Functionality - The game has, in a week's worth of playing, crashed once. And even then, autosaved my city so I could jump right back in. And as far as controls go, it's about as good a job as you can expect. You double-tap or pinch to zoom, you drag out zones and roads with your fingers, the slight inaccuracy of pointing towards such tiny grids compensated for by a tool that lets you move around a zone/road once laid down. Load Times - The iPhone's a machine for gaming on the go. So it's a shame that both saving and loading your cities can take an age, especially if you're playing on a large city (you're given a choice of two sizes). Oh, one other tiny gripe: you can't rotate the city, so you're stuck with the one viewpoint. This one's a no-brainer. You like SimCity, you'll like this. Simple! It's a full-blooded version, it's stable, it controls well, it's probably the most complete and satisfying iPhone port I've yet to come across. 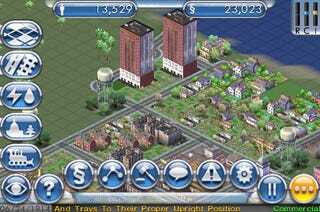 SimCity was developed and published by Electronic Arts. Released on December 15 for Apple iPhone, retails for $10, available on Apple App Store. Played both city sizes for 3-4 hours each so far.